Cheeky was five months old when he moved out of our room and into his own room. I was devastated. The weeks were whizzing by and he was growing up so fast. All the books said he should be in with us until he was six months old, except perhaps for Gina Ford who, if I remember correctly, expected babies to be in their own room from birth, sleeping through the night at two weeks and practically sitting up and feeding themselves at a month of old. Although, I might have made that bit up! Anyway, he was my first child and if the books said six months then six months it should be, but Cheeky wasn’t sleeping well in our room – he knew we were there and would wake up looking for attention and entertainment in the middle of the night. It made sense to move him out. I just wasn’t ready. It was the right time though and he slept so much better in his own room. Little H is two years and ten months. He finally slept in his own room for the first time last night. It was the right time for him and, I think, the right time for me too. Reflux and projectile vomiting at odd hours of the night was the first thing that prevented Little H moving out of our room. Unable to move his head out of the line of fire he would vomit all over himself and risk choking on it. At about six months old, when he ‘should’ have been ready to make the move to his own bedroom, I was regularly jumping out of bed at the slightest sound, dragging him from the cot and tipping him over while he threw up half the days feeds onto the layers of towels waiting expectantly on the floor. The washing machine was on constantly and it wasn’t unheard of to be stripping the bed two-three times a night and putting loads of washing on at 4am. The next issue was chest infections. Many a night was spent sat in the bathroom, perched on the closed toilet lid, with H coughing and wheezing away in my arms, the shower on full blast filling the room with steam. My hair, during those times, was a constant state of frizz and I developed an ability to doze sitting upright on a toilet – an impressive skill indeed. By far the biggest issue preventing Little H from progressing to a big boy bedroom though was his epilepsy. Without any warning he would stop breathing and turn blue for minutes at a time. No sudden movements, no warning noises; silently he would stop breathing and it was just a matter of time before the unthinkable could happen. We lived in a constant state of high alert, adrenaline coursing through our veins. Night time provided no respite, relying only on a sixth sense we would leap from the bed, one starting CPR while the other set the timer (to ensure we administered midazolam – his emergency medication – at three minutes) and switched on the oxygen. It was an unimaginable way to live. Most of the time H slept in the bed between us. Sudden stiffening of his limbs indicated the onset of a seizure and too exhausted and terrified to trust a sixth sense would wake us, we relied on this subtle movement to warn us in time. 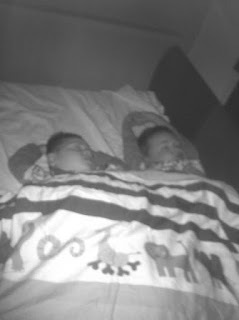 When he wasn’t in bed with us, his cot was at the foot of our bed and we slept the wrong way round in the bed so that our heads were only centimetres away from his. I often slept with my hand pushed through the bars of the cot holding his so I would know instantly if a seizure started. I must confess there were times I was so exhausted from the lack of sleep that I didn’t wake, but luckily the times I missed it, Mr. M woke and vice versa. Many a morning, before opening my eyes, I would pray Little H was still alive. Eventually we were given an apnoea monitor but it failed to work as throughout the seizure H continued to have tiny contractions in his stomach muscles which fooled the apnoea monitor into thinking he was still breathing – clever eh? So after much fighting and letter writing to Doctors and Consultants, a charity funded a SATs monitor for us so his oxygen levels could be monitored overnight but it took us months and months to trust it. To be fair, many a time we woke before the alarm started, showing that our sixth sense worked pretty well after all, but it was good to have the back up just in case. Little H continues to have seizures but thanks to the Ketogenic Diet hasn’t stopped breathing during a seizure for ten months. Considering it was happening around 25-30 times a month this is amazing and has transformed our lives and his. Gradually, as the gap between seizures grew, we moved his cot further and further away from our bed. It’s not a big room so that’s not very far in real terms but emotionally it was a huge leap. The next step was to get him into his own room and that finally happened last night. (Not so Little any more) H spent last night in the rather large profiling bed that was delivered yesterday rather than cramped and squashed in a tiny cot. He slept from 11:30 until 7:30 – which is mostly unheard of unless he is ill. In the room next door, I checked the numbers on his SATs monitor (the benefits of a tiny house is that the lead is long enough to have the monitor in our room) and watched him sleeping on a video monitor. I actually slept really well too. I’m not ready to let go completely just yet, but the wonders of modern technology mean that H can have that little bit of independence and make that next step to his own bedroom and I can trust that he is safe and that I’ll be alerted should anything untoward happen. Cheeky is determined to have a sleepover with his little brother too and since the bed is big enough for the two of them, I think that should be possible. My little boy is growing up, little by little, and I am so proud of him. Lovely post I am so pleased for you all. Love the photo too! I Know - I really had to fight for it. They reasoned that SATs monitors weren't readily used to detect seizures and that we would be woken unnecessarily too often. My argument was that I would rather wake 50 times unnecessarily than miss the one time I was needed. Oh, they always know best, don't they? Well done for sticking to your guns, it's just such a pity you have to fight for everything.